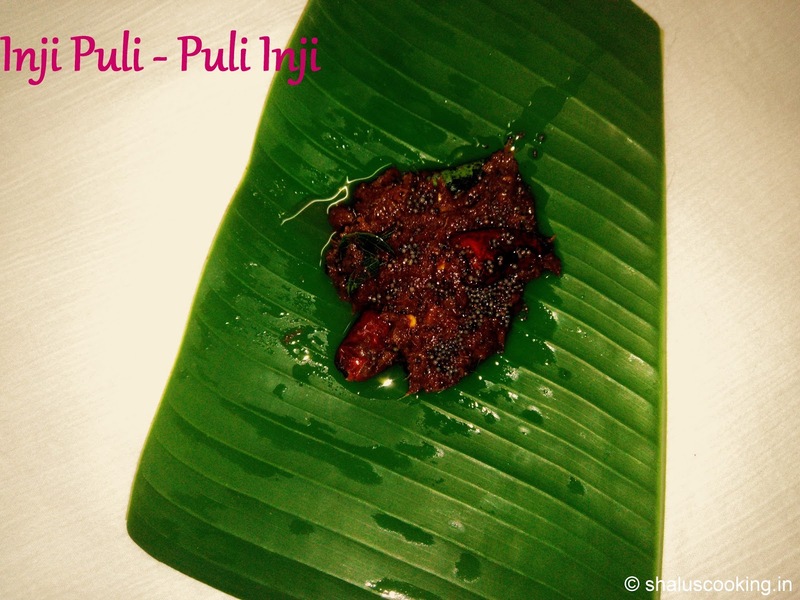 Inji Puli - Puli Inji, this is an authentic Kerala recipe. 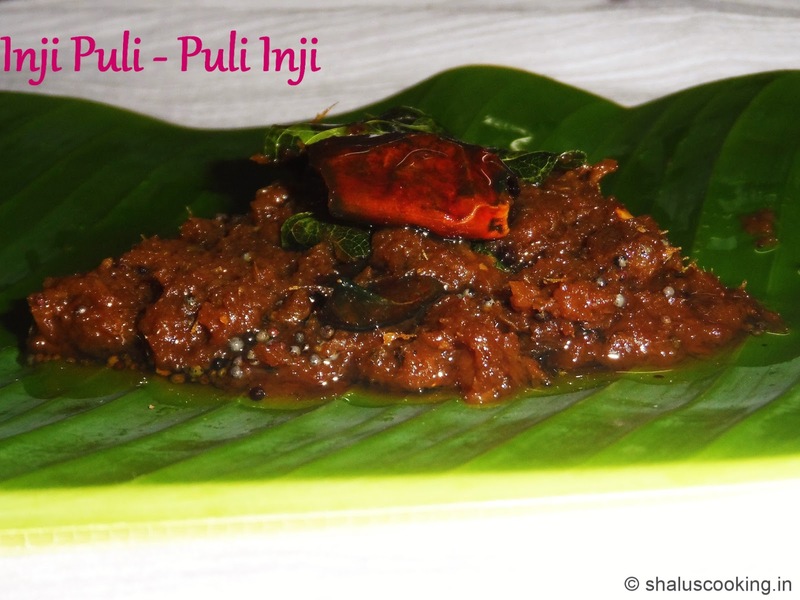 This is one of the famous dish in their Onam Sadhya Menu. As the name suggest, the main ingredients in this dish are ginger and tamarind. 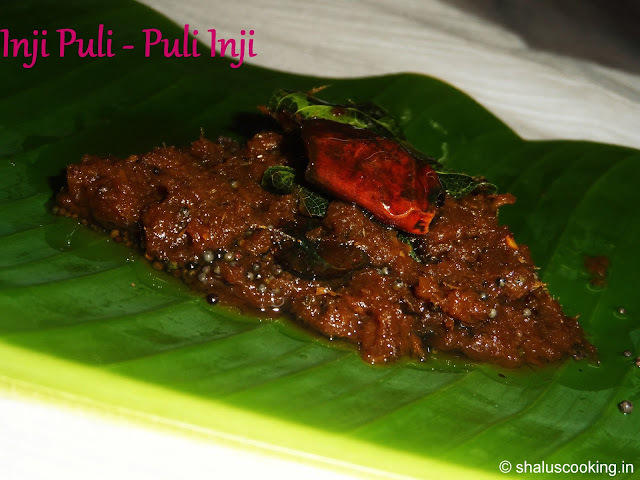 This dish is almost similar to the pickle or thokku that we make in Tamil Nadu. When I browsed the net for this recipe, there were lot of versions of this dish like grating the ginger, chopping the ginger, grinding the ginger etc., and also the method of preparation defers in each version. So, here is one of the method to prepare this famous dish. Gingelly Oil / Coconut Oil - 3 to 4 tbsp. Dried Red Chilli - 1 to 2 No. 1. Peel the ginger and wash it nicely. Finely chop the ginger and keep it ready. 2. Soak the tamarind in warm water for 15 minutes and extract its pulp and discard the fibre. 2. Heat oil in a pan and add the chopped ginger and slit green chilli. 3. Saute the ginger for few minutes till the ginger shrinks and nice aroma comes out. Transfer the ginger to a mixer jar when the color starts to change to brown. Allow it to cool. 4. In the mean while, add tamarind extract, chilli powder, turmeric powder and salt in a pan and bring to boil. Now, grind the fried ginger and green chilli to a coarse paste. 5. When the tamarind extract boils and reduces a little, add the ground ginger paste. 6. Mix the ginger well with the tamarind extract. Allow the ginger to blend well with the tamarind. Cook on low flame till the water evaporates and the ginger mix become thick. Now add the jaggery. 7. Mix well till the jaggery melts. Once done, switch off the flame and temper it with the ingredients listed under "To Temper" section. We are done with the Onam Sadhya special Inji Puli - Puli Inji.